Never before has the Spider, Master of Men, crusader extraordinary against the Underworld, been faced with such overwhelming difficulties. A magically persuasive radio voice luring thousands of young people to crime; a scientific madman dealing germicidal death over the nation; every criminal gang in the country organized to levy toll by stark terror...how can Richard Wentworth link these facts, weave a web of retribution for the Doom Dealer? With his beloved Nita captured and waiting for a ghastly old-world torture, his one-time friend Kirkpatrick ordering police on his trail to 'Kill at Sight! 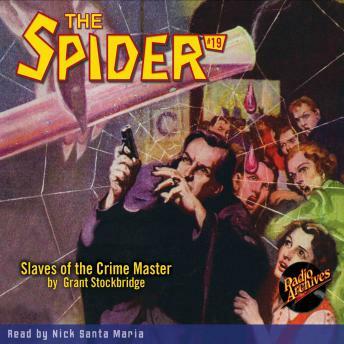 ', his every movement hampered not only by outlaws but by the law itself - can even the Spider find a way to free humanity from the grip of wholesale destruction being planned for it by the greatest of all Crime Masters?